Le Club Accorhotels has a new promo for stays in Latin America properties between August 1 – September 30, 2014. You can earn 400 bonus points for staying four nights. The offer is valid for bookings made between August 1-31, 2014. You can make your Accor bookings here and access this offer on Accor’s website here . Note that there seems to be a typo on Accor’s web page for this offer. The valid stay dates are August 1 – September 30 per the T&C’s but only September 1-30 on the text copy. 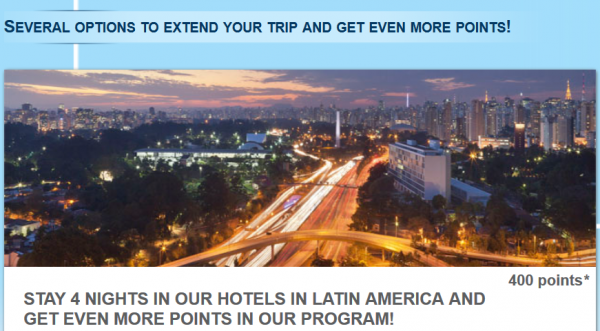 Not a very generous offer, but worth taking advantage if you are staying at an Accor property in Latin America during the promotional period. 1. The general conditions of Le Club Accorhotels apply to the offer ”Several options to extend your trip and get even more points!”. 2. This offer is valid for bookings from 01/08/2014 to 31/08/2014 and stays from 01/08/2014 to 30/09/2014. 3. The bonus points are calculated on the basis of points accumulated by the member based on the status “Classic” without point acceleration. 5. The member must provide the number of their loyalty card or membership number when booking, besides presenting their card at the front desk at check-in. 6. Reservations that include several rooms covered by the same member during their stay are only counted as one stay. 8. This offer is subject to hotel availability. General sales terms and conditions apply for reserved public rates specific to each hotel. 9. Points will be credited within 10 days after the check-out of guest. 11. Offer valid for stays of minimum4 nights in the same stay. Next articleWhine Wednesdays: How Many Carry-Ons Are Too Many?